Gmail Notifier Pro uses modern Windows 10 user interface. Gmail Notifier Pro is fully compatible with Microsoft Windows 10. Gmail Notifier Pro supports 32-bit & 64-bit Windows XP, Windows Vista, Windows 7, Windows 8 & Windows 10. Gmail Notifier Pro has been verified to work with Microsoft Windows 10, the latest version of Windows. When installing Gmail Notifier Pro using the MSI-installer, administrator privileges are required. If User Access Control (UAC) is enabled, Windows 10 will prompt for administrator password in the UAC dialog. Any user can run Gmail Notifier Pro on Windows 10. Administrator privileges are not required. However, when upgrading Gmail Notifier Pro to a later version, Windows 10 will prompt for the administrator password in the UAC dialog, to allow updating the software. 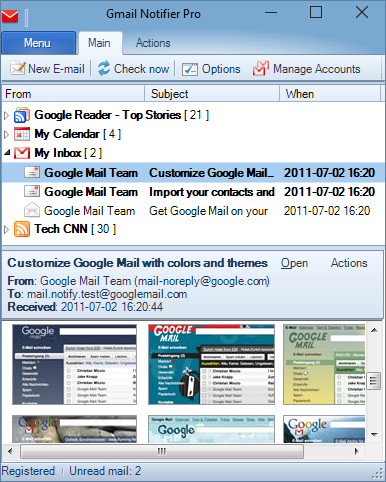 Gmail Notifier Pro requires Microsoft .NET Framework 3.5 SP1 to run. Windows 10 only includes .NET Framework 4.6, but can automatically detect and install .NET Framework 3.5 SP1 when launching Gmail Notifier Pro for the first time. Use this link to manually install Microsoft .NET Framework 3.5 SP1.